Hulu handed out Season 2 renewals for both Marvel's Runaways and Future Man, which comes just one day before the season finale of Marvel's Runaways launches on January 9. Both shows were given 13-episode orders, which is an increase from the 10-episode Season 1 of Runaways, while it's on par with the 13-episode first season for Future Man. No production schedule was given for these new shows, and it remains unclear when the new seasons will debut on the Hulu streaming service. Every teenager thinks their parents are evil. What if you found out they actually were? Marvel's Runaways is the story of six diverse teenagers who can barely stand each other but who must unite against a common foe - their parents. The series stars Rhenzy Feliz as Alex Wilder, Lyrica Okano as Nico Minoru, Virginia Gardner as Karolina Dean, Ariela Barer as Gert Yorkes, Gregg Sulkin as Chase Stein and Allegra Acosta as Molly Hernandez. The Runaways' parents, known as The Pride, are Annie Wersching and Kip Pardue as Karolina's parents, Leslie and Frank Dean, Ryan Sands and Angel Parker as Alex's parents, Geoffrey and Catherine Wilder, James Yaegashi and Brittany Ishibashi as Nico's parents, Robert and Tina Minoru, Kevin Weisman and Brigid Brannagh as Gert's parents, Dale and Stacey Yorkes, and James Marsters ad Ever Carradine as Chase's parents, Victor and Janet Stein. Julian McMahon also stars as the pivotal character Jonah. Marvel's Runaways is executive produced by series showrunners/writers Josh Schwartz and Stephanie Savage (The O.C. and Gossip Girl) along with Marvel's Head of Television, Jeph Loeb (Marvel's Jessica Jones, Marvel's The Defenders) and Jim Chory (Marvel's The Defenders, Marvel's Jessica Jones) Fake Empire's Lis Rowinski will produce as well. Marvel's Runaways is a co-production with ABC Signature Studios. It isn't clear when production will begin on this new season, or when the production will announce any new Runaways cast members. Hopefully Hulu will release more details on this Marvel series soon. 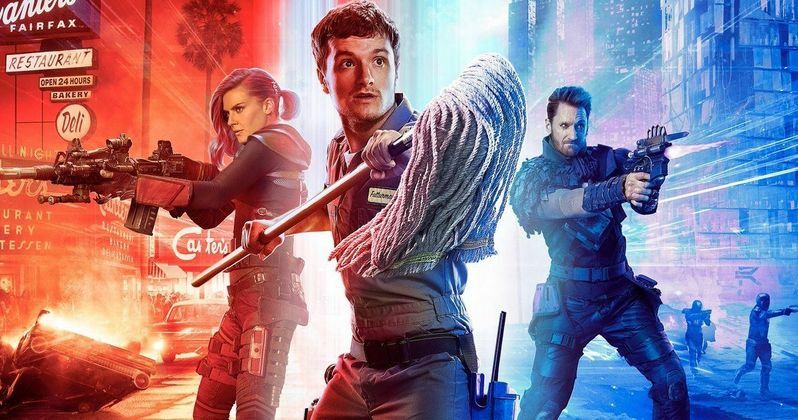 Future Man stars Josh Hutcherson (The Hunger Games) as Josh Futturman, a janitor by day/gamer by night who is recruited by mysterious visitors to travel through time in order to prevent the extinction of humanity. The cast also includes Britt Lower as Jeri, Derek Wilson as Wolf, Ed Begley, Jr. as Gabe Futterman, Eliza Coupe as Tiger, Glenne Headly as Diane Futterman, Haley Joel Osment as Dr. Stu Camillo, Keith David as Dr. Elias Kronish and Robert Craighead as Vincent Skarsgaard. No details about the second season have been given at this time, or details about new and/or returning characters. Future Man is created and executive produced by Kyle Hunter and Ariel Shaffir (Sausage Party), and the pilot episode was executive produced and directed by Seth Rogen and Evan Goldberg, who would go on to direct two more episodes of the first season as well. The series is also executive produced by Matt Tolmach, James Weaver and Ben Karlin, with Josh Hutcherson also serving as a producer. Future Man is produced by Point Grey Pictures, Matt Tolmach Productions and Turkeyfoot Productions, in association with Sony Pictures Television. Hopefully we'll have more details on both of these Hulu shows very soon.